An interior designer and a documentary film score composer put their stamp on a Beltline apartment. Kendra and Connor Robinson at their Beltline apartment. Photograph by Kait Kucy. Kendra and Connor Robinson moved to Calgary from Medicine Hat a few years ago for new experiences and career opportunities. The husband and wife met as teenagers through their love of music, and both of them were music instructors before they made the move to the big city. After a few different less-than-inspiring living situations, the couple has hit their stride in their heritage building apartment located in Calgary’s Beltline. 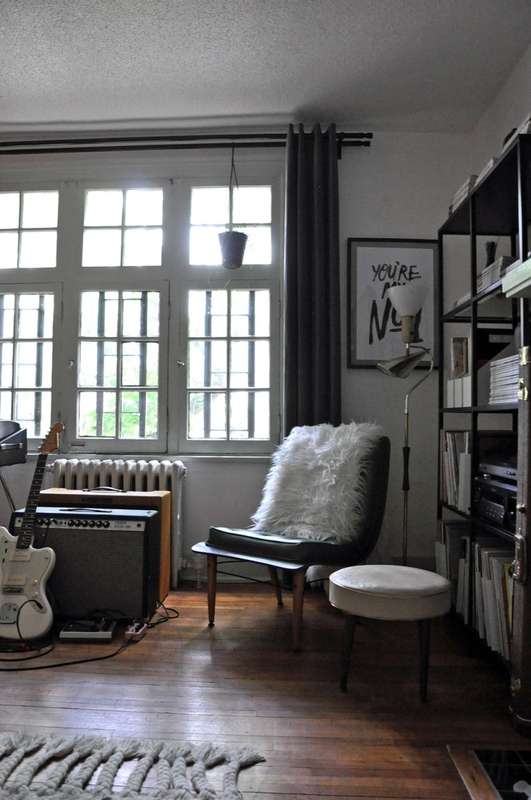 The one-bedroom apartment is full of the Robinsons’ passions: music, books, art and design. Kendra, a recent graduate of the Mount Royal University interior design program, and Connor, a musician, percussion instructor and documentary film score composer, have both put their personal stamp on the home. 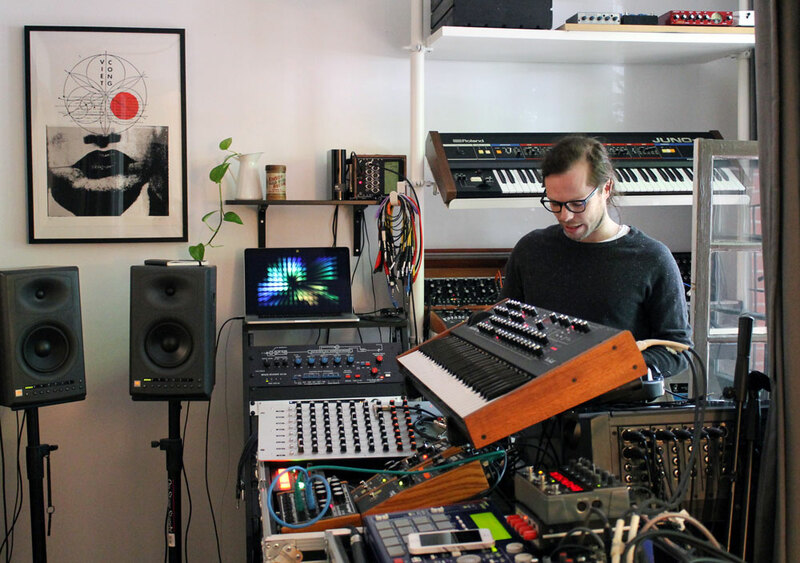 Connor Robinson: I’d like to say less is more, but then you look at my studio and it doesn’t look like that. I prefer to live clean and simply. Kendra Robinson: My philosophy is living with intention. Only surround yourself with the things you need or the things you love. And things that tell a story about your life or sentimental items passed down through your family. CR: Absolutely the studio room. I teach percussion at Long & McQuade five days a week except during the summer. When I’m not there, I am spending many late nights in here working on music. 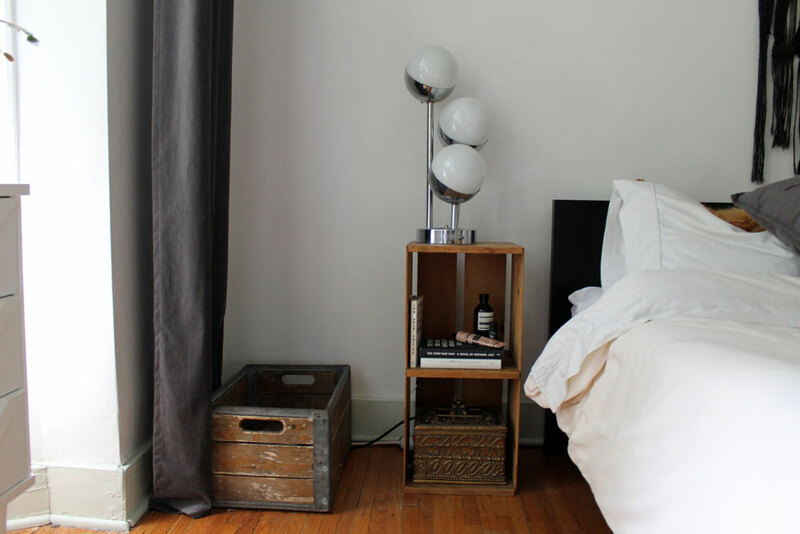 KR: I love, love, love the natural light of our bedroom – there is something really magical about it. And I really do love our living room because it is a museum of our life’s artifacts and hobbies. There is a very comfortable vibe in here. When I was younger, I loved watching movies of people living in their Brooklyn apartments. They would come home to their beautiful old building with their box of Chinese noodles and sit on their sofa amongst their little trinkets. This is my tiny version of that. What is your most treasured item and where is it from? KR: I lost my grandma back in the spring of this year. My childhood memories of her were her always in the garden, picking vegetables, cleaning vegetables and making salads in our kitchen. She had this old pair of milk glass salt and pepper shakers and she would use them to make a salad of lettuce, sour cream, vinegar and salt and pepper. Every time I use that pepper shaker I get transported into those memories. CR: I’d probably choose my guitar. 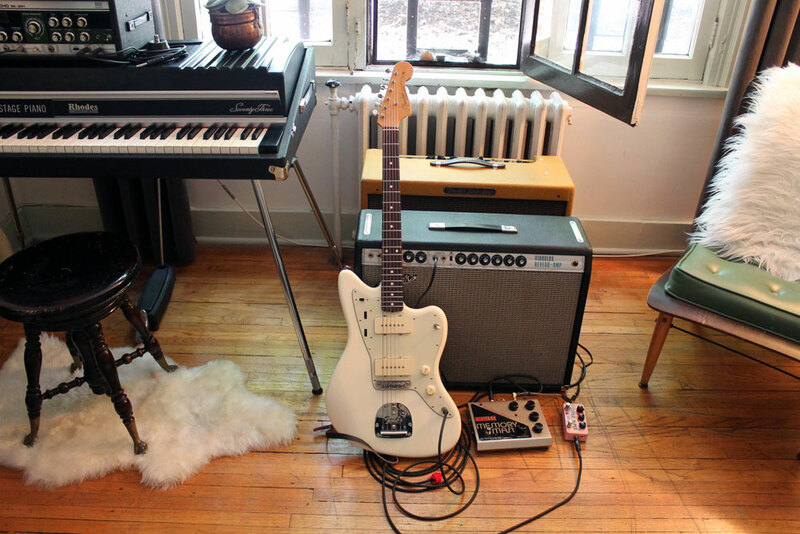 It’s not even that old – I think it is a 2009 Jazzmaster. I’ve always wanted a white guitar for some reason. What is your favourite decor find? KR: I did a semester of school in London for six months and I wanted to bring something back that wasn’t a cheesy British souvenir. I stumbled onto the Brooklyn Market to a vendor that was selling old scrolls of London bus numbers. I love that the scroll is part of my experience that is always here with me. Where do you seek out inspiration? KR: I feel like inspiration finds me. Obviously there is Pinterest and Instagram. Also, experience is a huge thing for me when I travel. Even small things, I’ll file away in my brain for later. There is definitely not just one place I look to for inspiration, but I think that’s what makes a good designer. CR: In terms of getting inspired while working on music from home, I usually just start with no ideas at all create one little sound and build from there. My work is not entirely inspiration-driven. It’s more like walking through a forest and happening upon something cool. CR: I just love living in the Beltline. When we first moved to Calgary we lived in Braeside and I felt like it was exactly like living in Medicine Hat. Then we moved downtown within the proximity of everything I love and it changed my opinion of the city. KR: I think that there is an undeniable spirit about this place and the type of that people that are attracted to it. You walk up to this Tudor-style building amongst all of these corporate offices and you feel like you’ve stumbled upon a real gem. Where do you like to shop for decor locally? KR: If I wasn’t on a post-university student budget I’d probably be shopping at different places than I do now. I love thrifting and I’m always on the hunt at antique markets and thrift stores. I love going to Kit Interior Objects. Did you encounter any decor challenges? KR: When we moved in, I was in my last semester of university so it was three months of living amongst boxes. We moved from a 1,000-square-foot, two-storey house in Medicine Hat, so trying to downsize into this 800-square-foot apartment was a challenge. When you have hobbies like music, they tend to take over the space but we’ve tried to make everything as functional as possible to fit our lifestyle. What is your favourite view from your home? KR: We feel lucky to have a lot of vegetation right outside our windows. It is so beautiful in the fall, spring and summer. What would you want your next home to be? CR: This place with one more room. KR: I agree – an extra bedroom would be great and a little bit of an outdoor space. We don’t need a yard but it would be great to have a balcony to do some barbecuing, have some drinks and grow some herbs. And it would be great to have a dishwasher! Despite being a ground floor suite, the Robinsons’ heritage apartment gets a lot of natural light during the day. 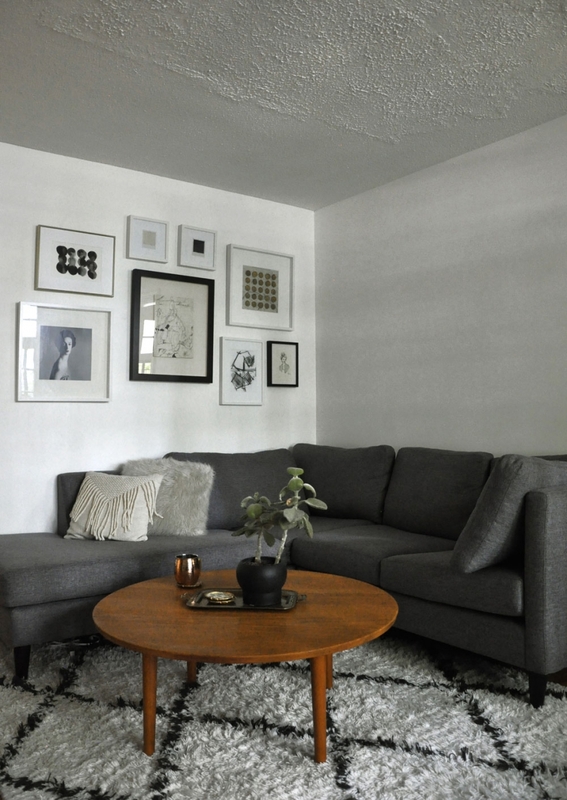 The couple keeps things simple for their living area with a grey, black and white monochromatic colour scheme, but introduces some intrigue with an eclectic gallery wall. 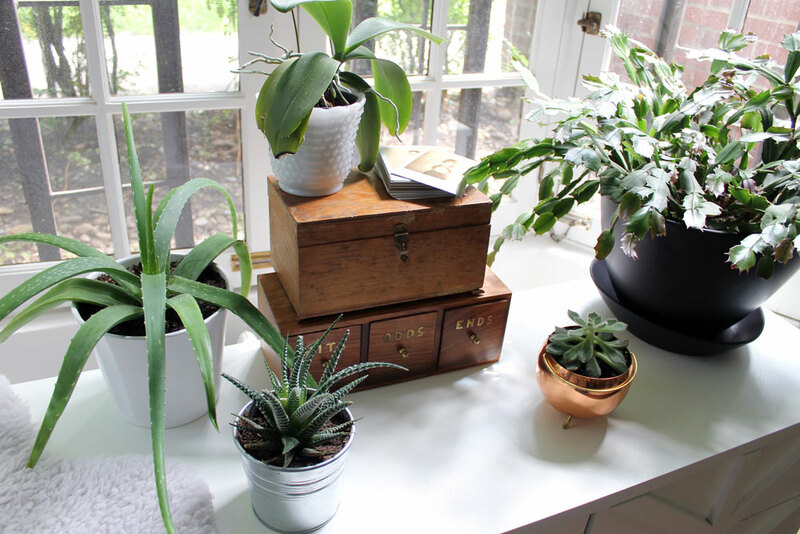 The bedroom’s bay window brings in lots of natural light, perfect for the Robinsons’ collection of small plants and succulents. The objects found in the Robinson’s home are souvenirs from their travels. They are mementos of their time away from Alberta. 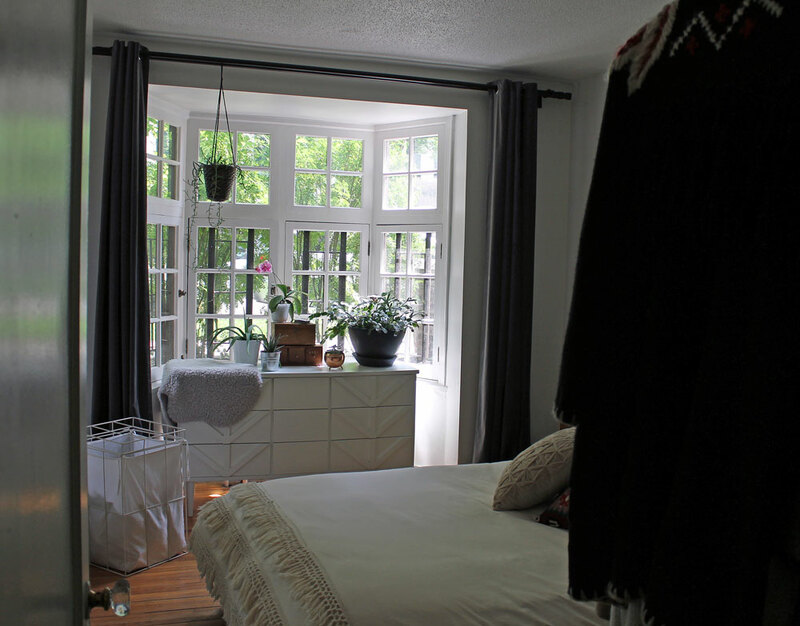 The big bay window and Kendra’s styling makes the bedroom particularly charming. 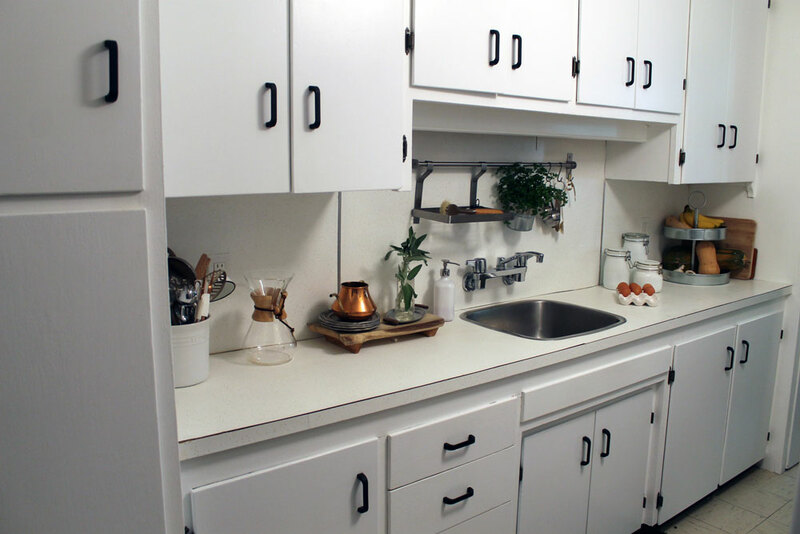 The Robinsons’ galley kitchen is bright white with copper accents. 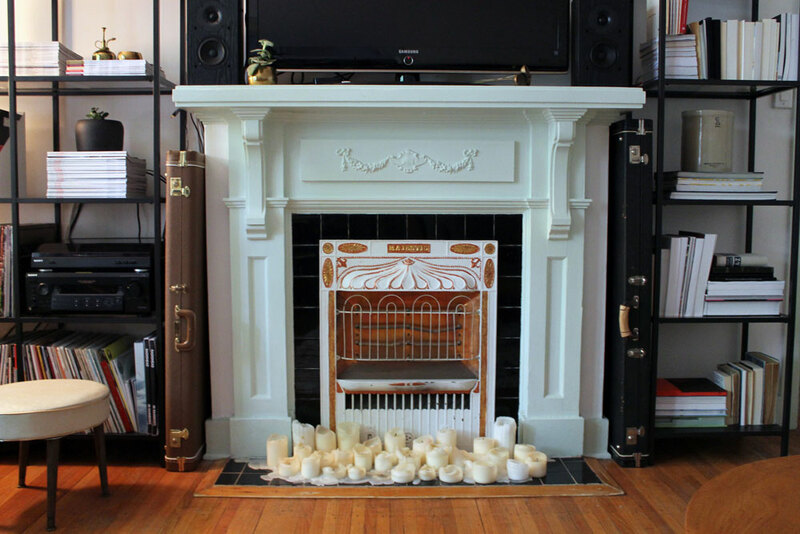 The suite’s original fireplace is a prominent feature of the Robinson’s home. They added a romantic gathering of off-white pillar candles. This vintage bus stop scroll is from Kendra’s semester abroad in London. It is one of her favourite decor finds. 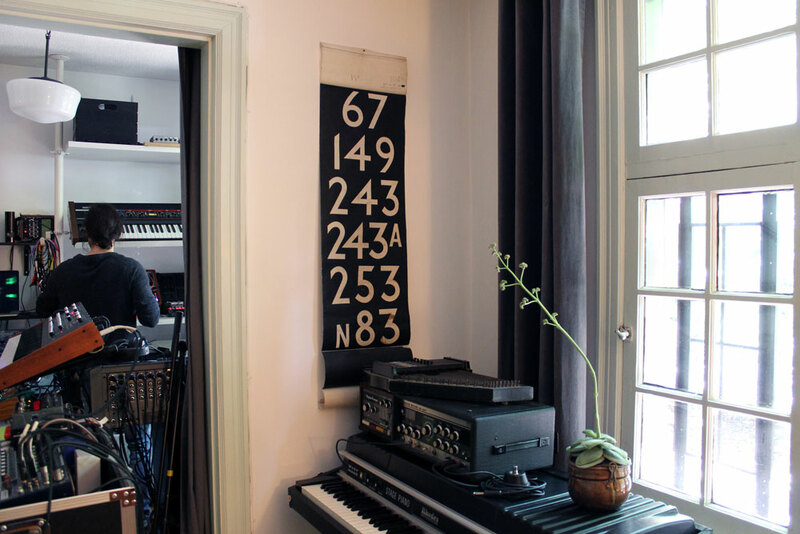 Connor’s in-home music studio is where he spends many nights working on his compositions. 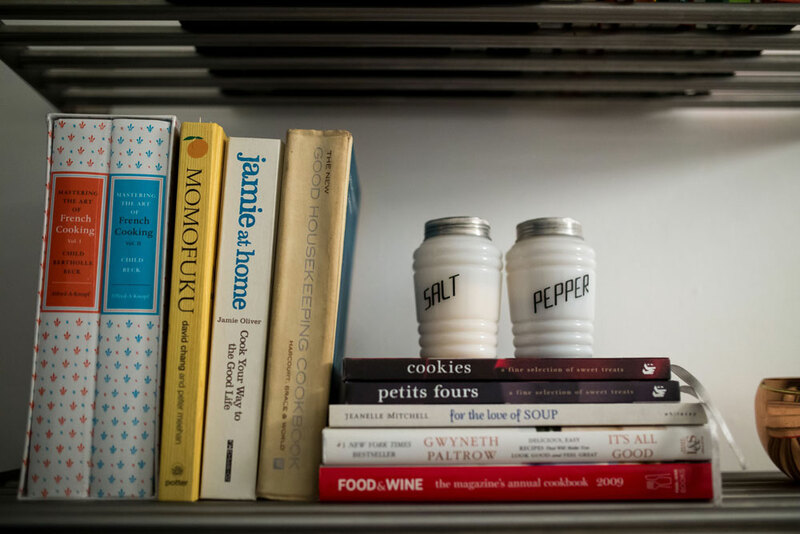 These vintage milk glass salt and pepper shakers are Kendra’s most treasured item as they bring back childhood memories of spending time with her grandmother. A white electric guitar was always on his wish list, making this gem Connor’s favourite item in the home.